Learn more about the Max Michel 1911 in Dennis Adler's Airgun Experience Blog. Designed by Sig Sauer team captain and world speed shooting champion, Max Michel, Jr., this 1911 CO2 powered BB gun is a replica of the Sig Sauer 1911MAX firearm. This pistol is designed with all of the features that a world-class shooter requires. The frame features forward cocking serrations, and Max's signature is engraved on the slide. The unique grips offer an aggressive, non-slip surface for shooting comfort. 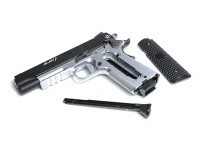 This replica pistol includes the Sig Sauer flat trigger and an under barrel rail for accessories. Things I would have changed: I would like to see increased velocity. 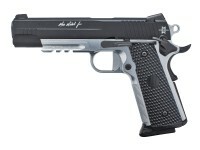 What others should know: The Sig Sauer (brand named) Max 1911 is just like the Crosman Model 11 but with less velocity , 1 less BB, a useless under rail and decent White Dot Sights,,,and $23 more than the Model 11, you just gotta paint the front sight blade on the Modell 11 But both good 1911 BB pistols. Things I liked: it looks great but that's about all. nice checkering on the front strap. Things I would have changed: co2 loading is to hard for me-took 5 cartridges to finally get 1 in. heavy trigger pull. cheap plastic mags it seems every sig I own loads the co2 differently. Things I liked: Good Blow-back! Nice 3-Dot sights! Things I would have changed: The packaging is horrible, the plastic clam shell. The finish is disappointing! The silver color is exactly that...silver paint but not even close to the finish they put on the Winchester. The trigger pull is extremely heavy. Hoping that might smooth out with some extended use. The Co2 piercing is horrible!! What others should know: This is a Winchester Model 11K with a facelift. Mechanically it is the identical gun, in fact the magazines are interchangeable. This is made in Japan which is usually a good thing. I would purchase the Winchester between the two, but If you are looking for a SIG 1911, then purchase the Sig Sauer 1911 tactical Full Metal Blowback. It's more money but it is by far the best 1911 CO2 BB on the market. Its a fake! 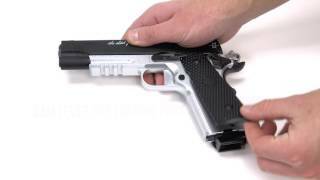 The 1911 Tactical is not made by Sig Sauer. I had one and after 6 months it had lost of problems. Sig told me is was not made by them and there not warranting it. I could not get parts anywhere for that piece of crap! Threw it away! If it were a Sig Sauer it would have a 1 year warranty!! 09/05/2017 So what's the deal on purchasing extra mags for this gun? I searched Pyramid Air for them and I didn't see them listed. I'm not interested in the gun if I have to buy (shoe-less) Win Model 1911 mags. Same problem with the Sig Spartan and Sig P226 X-five. No dedicated replacement mags. Have not seen anything offered from Sig yet. Seems it takes a while from the time they release a gun to the time they put extra mags out. the cartridge/clip setup looks just like the Winchester 1911, 1911K. will the clips for the Win fit the Max? A Winchester Model 11 magazine (PY-A-4932) is identical to the magazine that comes with the gun, except it doesn't have the bottom "shoe". It fits perfectly.